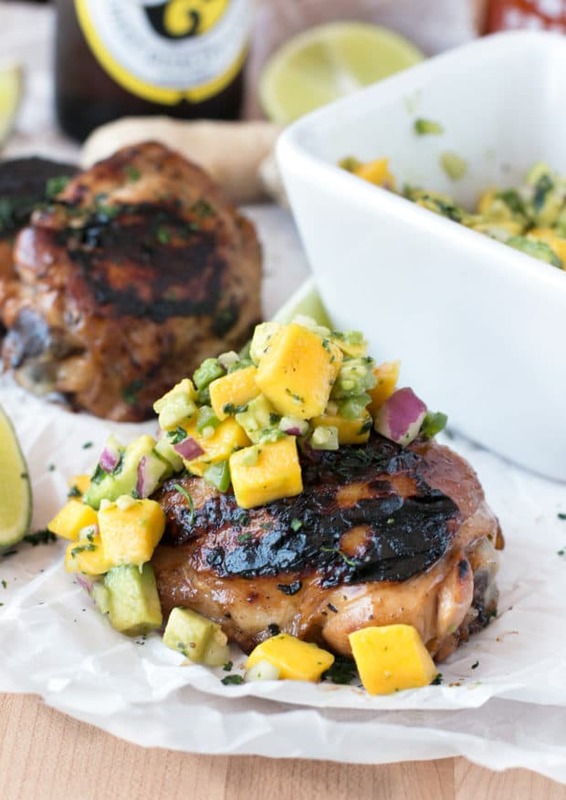 Spicy Ginger Grilled Chicken Thighs with Avocado Salsa are a juicy, flavorful grilled dish that you can eat so many different ways! Eat the thighs as is with the salsa, shred the meat and make tacos, or make crostini out of the meat with the salsa on top. 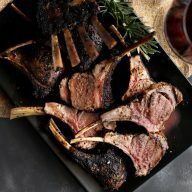 It is grilled dishes like this that always give you an excuse to celebrate! I just love recipes that I can use over and over again in new ways, don’t you? When you find a really solid, simple dish like that it makes figuring out weeknight dinners a whole lot easier to come up with. This grilled chicken thighs recipe is a recipe that you can use over and over again without getting bored with it. 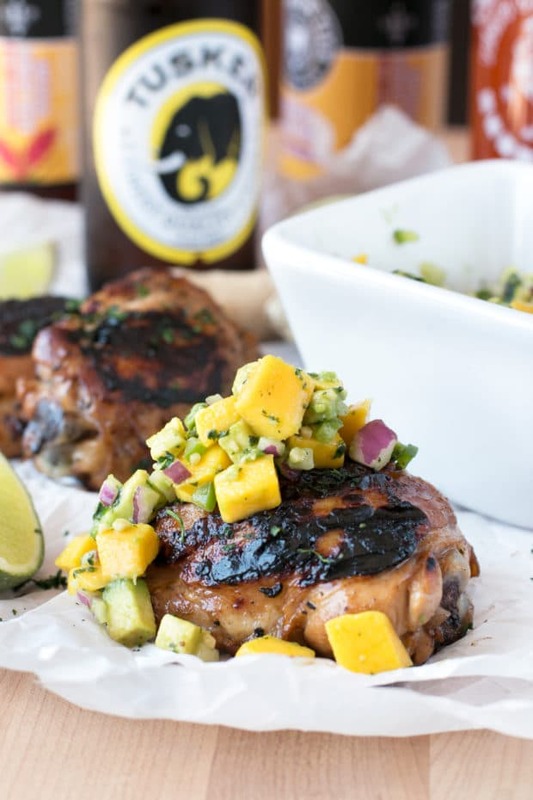 The grilled chicken thighs are flavorful and juicy, so you can be perfectly satisfied with just chowing down on those thighs and the salsa, with perhaps a side of rice and black beans, without wishing you had something more. But the fun doesn’t end there. You can make this recipe next week and no one will know the difference when you serve the meat up on tacos and top it with the salsa. 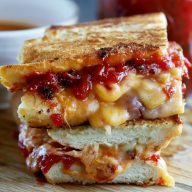 It also makes a great appetizer when you pile up the meat on toasted bread with the salsa. Heck you can even make a killer burrito bowl with the meat, rice, black beans, the mango avocado salsa, and some hot sauce. 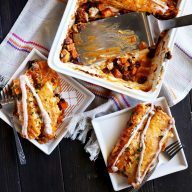 All I can say is that this recipe is going to become a staple in your home from the moment everyone takes that first bite. 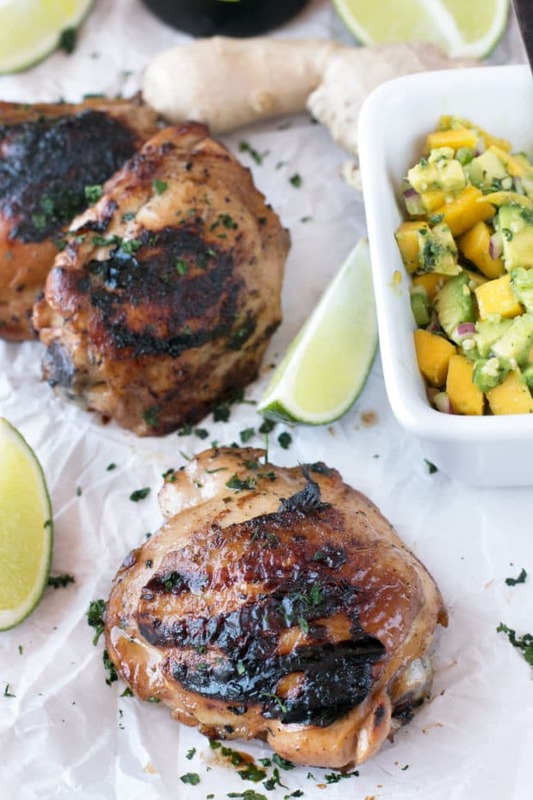 The spicy ginger marinade on the chicken thighs guarantees they will be nice and juicy. 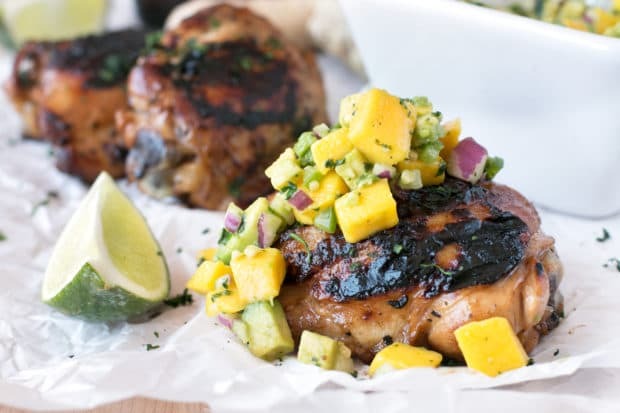 The meat is tender and melts in your mouth, so when it pairs with the mango avocado salsa, it explodes with bright and fresh flavors in your mouth. In other words, it’s just oh-so summer. is the grill I keep going back to again and again. Don’t have a grill (or the space for one)? Enter the Lodge Cast Iron Square Grill Pan! 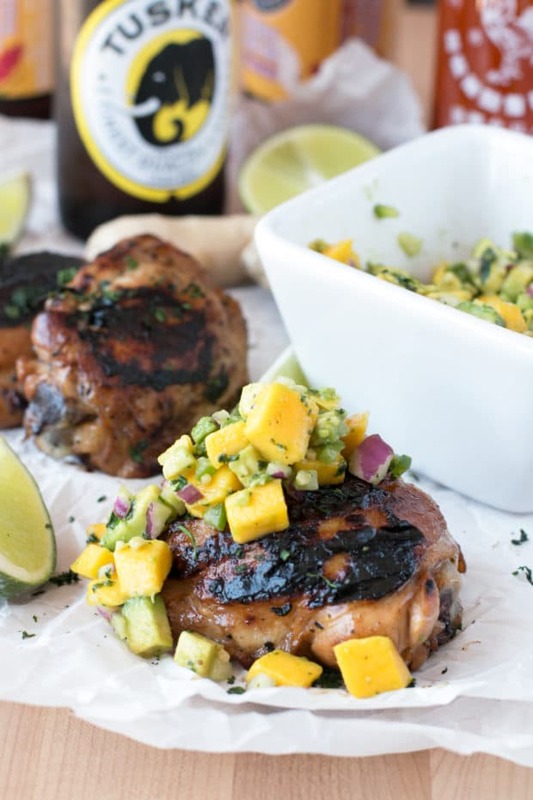 Pin this Spicy Ginger Grilled Chicken Thighs with Avocado Salsa recipe for later!